Capricorn Habits - "Hard work is the key to success" The Capricorns keep chanting this mantra frequently. Their pragmatic nature makes them rooted to the ground and they don't believe in miracles. They believe in working hard in order to achieve success and on their quest to achieve that they miss out on a lot of beautiful things in life. They are hopeless work addicts and their need for providing the best usually makes their life full of work and no play. Only few Capricorns governed by the planet Venus believe in having fun while they work but other than them you will only find a handful that wait for their luck to click. Capricorns are not tight fisted but they work hard to save. Their pessimistic nature makes them worry a lot about their unforeseen future and they feel it is necessary for them to "make hay while the sun shines." This often causes them needless worries and tensions. 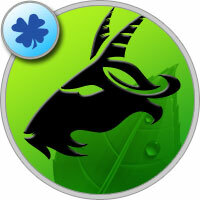 Food for Capricorns - The Capricorns are realist and practical in nature. As much as they believe in working hard, saving and providing, they also believe that one can do none of those if they aren't healthy. Hence, they believe that the body needs frequent recharge of good nutritious food. They enjoy their healthy meal but the only drawback despite eating healthy is the fact that it lacks variety. So they need to try and experiment different recipes. The goat rules the bone and the teeth region hence it becomes extremely important for them to have a good intake of calcium content which includes lots of dairy products like milk, cheese, curd, butter milk. Fish, salmon, lots of green leafy vegetables are also very healthy for their body. Capricorn Health - They say with age comes good health for the Capricorns. As kids, they are usually very weak and fragile, they frequently fall ill and they spend most of their tender age relying on medicines but as they grow up they tend to become healthier and the use of medicine lessens visibly. Their working addiction may affect their brains and can give them stress related issues. The Capricorns need to stay away from drugs, alcohol, cigarettes, oily food and any sort of addictions. The Capricorns rule the bone and the teeth region which is why they need to take extra care of these regions. They are prone to accidents that might affect these regions like fractures, sprains or they might even break their leg if they aren't too cautious. When age gets by they might develop arthritis, knee and joint pains. The other possible threats are migraines, kidney stones, skin allergies, liver and poor digestive functions. Capricorn Beauty scope - Capricorns are generally good looking but more than that it is their nature that makes them more attractive. They aren't too flashy and loud with their outfit and they don't follow fashion blindly. They usually choose comfort over style and they look best in their traditional wear. They like donning and showcasing their family heirloom when it comes to jewellery.